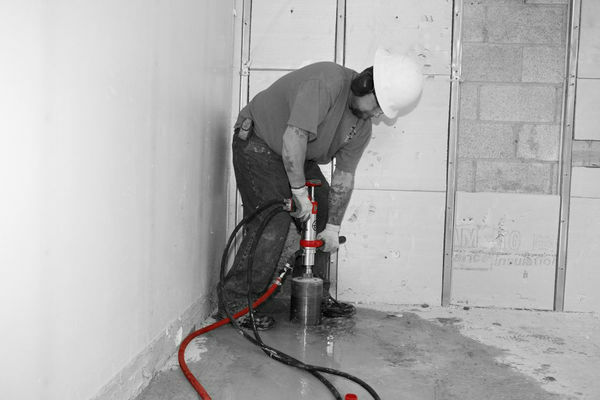 CP hydraulic core drills are ideal for working in confined areas - installing drainage, swer and water pipes, or cable and ventilation ducts where large, deep holes are needed. They can be operated freehand or mounted in a drill stand. The core drill comes with a strong steel case for transport and storage. 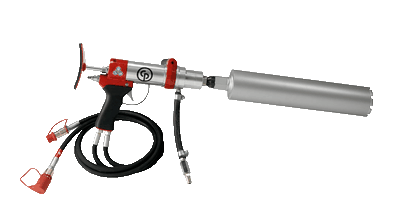 Hydraulic control of the drill torque helps reduce kickback when drill bits jam. You are in control, eve3n when drilling holes of 200mm diameter and above. In addition, due to the compact design of the CP core drill, you can easily drill holes of up to 200mm freehand. * 1⁄2" BSP male x 1-1⁄4" UNC male drive adaptor included for use of larger diameter core bits. ** Full details of measurement are available in the Safety and Operating instructions of this product. For concrete, reinforced concrete, and brickwork. Diamond blades and core bits need a constant supply of water to cool, flush away slurry, and surpress dust. On remote sites where there is no water supply, we recommend the CP water kit, a small pressurized water container.